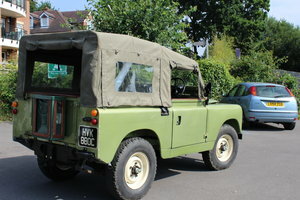 Here for sale is my largely original series 2 Land Rover in bronze green. Please note...... the overdrive unit is not included in the sale of this Land Rover as it’s the only one I have and need it for my series 3 safari! Sorry , they’re a bit pricy now. New Parts, Smiths Heater Matrix Carburettor Battery Water pump Fan Blade and Pully Top Water Hose Dip Switch Original and very rare genuine series 2 rubber floor mats! Original starting handle, Shelley Jack and jack handle. 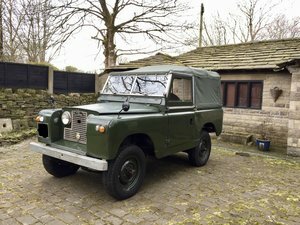 These genuine series 2 Land Rovers are becoming increasing popular and harder to source in good, original and unrestored condition. This particular example is a little cracker which retains much of its important originality including the original chassis which is in very solid sound state which bares the correct chassis number. The engine is numbered 151126263 which is spot on for a 1961 series 2 petrol but with the history I have the photo copy of the continuation log book for 1971 shows a different engine number, however if it’s not the original engine then someone has been careful and sensible in fitting the very next best thing! The registration number is correct and original to the vehicle and even the aluminium plates are the ones that it would of had from when it was first registered. I have history going back to 1971 (photo copies from DVLA) and it shows the first owner as Mr Stephenson of Frith Farm in Dorset (now a national trust property). 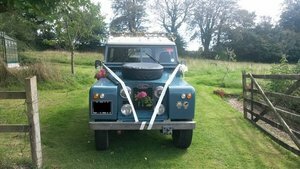 He had the Land Rover from new until 1976 when it was sold to Victor Charles in Crewkerne. There were a few owners over the years and one to mention is Sir Michael James D Stear of Hayne Farm Cullompton here in Devon. He is highly decorated as a senior commander of the Royal Air Force gaining a KCB , CBE and DL in the Birthday Honours of 1982 and New Year,s Honours of 1990 respectively (not including the DL which was appointed much later) ..... anyway, there’s some history with the series 2 which often you don’t really get with these old series Land Rovers. So back to the vehicle in question:- mechanically it is in very good order benefitting from a recent carburettor, battery, water pump , pully and fan. Full choke is required for starting but soon this can be eased off. The engine runs very smoothly with no untoward noises. There is very very little oil consumption and no blue/white smoke from the exhaust . There is no temperature gauge (as standard on a series 2) but there isn’t any trouble with overheating. I have done nearly 200 miles without any great issue. The gearbox I believe is the original unit and functions well but of course it has the usual traits of series gearboxes with occasionally slipping out of 1st gear on overrun - no great issue and have got to grips fully with handling the gears. The clutch is very good and functions very well and smoothly with no slippage or judder. The braking system is very good - all brakes work well and pull the vehicle to a stop in a straight line. There are no leaks from the engine, gearbox, axles or cooling system - remarkable for a series Land Rover! Pretty much all the electrics work well - indicators, side lights, dipped/main beam , tail lights and number plate light. The instrument panel illumination works as well. Working fuel gauge. The vehicle has been converted to an alternator and the amps gauge hasn’t been wired to this although I’m sure it can be done. The oil pressure light isn’t working but there are no issues with oil pressure on this engine. 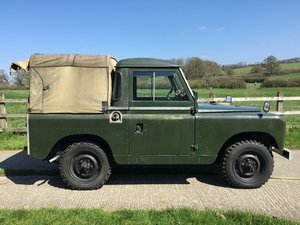 Bulkhead is very good along with the general panels and alignment - plenty of knocks and scrapes but totally charming and part of a true Land Rover’s history - no one should ever nut and bolt this example...... it should be listed! All four wheel drive and hi/low work fine. Free wheeling hubs are fitted. Tyres are in good condition (7.50 x 16) Rear “cat flap” tailgate is in sound clean condition as is the tailgate and all functioning reasonably well - lock is stuck but the handle works fine. A new lock mechanism can be purchased easy enough. Oh yes, there is a brand spanking new Smiths heater matrix fitted and working well. The Driver’s wiper works fine too. The passenger side will need a wiper motor fitting - never had one with this vehicle but really it should be done. The chassis will need waxoiling but I will not do this as I want the next owner to see for themselves how good this original chassis is. The passenger footwell has a small hole but nothing of any great consequence. Points to be aware of :- Doors are from a series 3 (including hinges) Only a couple of times I’ve had fuel vaporisation but have over come this by either a squirt of easy start or dribbling a small amount of fuel down the carburettor - I recommend setting the carb up properly although it does preform fine as it is. No wiper motor/arm/blade on passenger side. Original colour of green but at some point some reprobate painted it blue! It’s now been (obviously a number of years ago) put back to bronze green. Included in the sale is a canvass hood and hoops - I think this is the set up that is compatible with the truck cab arrangement. Anyway, some worth there in spares. History includes a list of all owners and photo copies of old log books. Some old MOTs and tax discs. 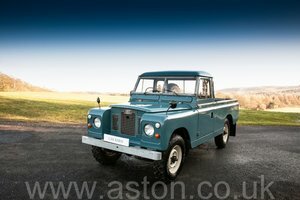 Ideally this Land Rover would suit a collector/enthusiast that’s looking ahead to invest in the right example. I will not tell you (like so many others do) that these vehicles are “only going to go one way” as simply any market (especially in luxury goods) can and has crashed before! .......... but with current trends these vehicles at the time of writing this are continuing to grow in value. Please contact me on 07784 227 307 for extra details or message . I do have the contact details for a couple of transport companies that can deliver this vehicle for you if you needed that to be done - they’re both very professional and competitive on price. Thanks for looking, Kirk.